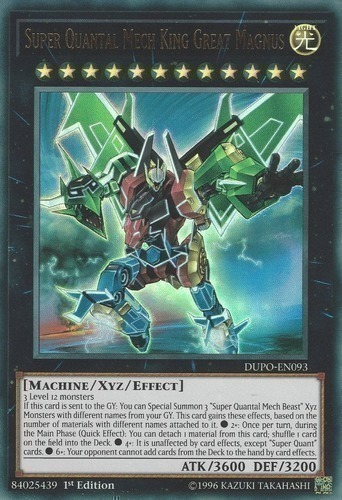 If this card is sent to the GY: You can Special Summon 3 "Super Quantal Mech Beast" Xyz Monsters with different names from your GY. This card gains these effects, based on the number of materials with different names attached to it. ● 2+: Once per turn, during the Main Phase (Quick Effect): You can detach 1 material from this card; shuffle 1 card on the field into the Deck. ● 4+: It is unaffected by card effects, except "Super Quant" cards. ● 6+: Your opponent cannot add cards from the Deck to the hand by card effects.